As many of you are no doubt aware, last year was the 30th anniversary of a certain orange and red intergalactic bounty hunter's series. Of course, you'd be forgiven for missing this; aside from releasing the middling spin-off Metroid Prime: Federation Force, the Big N let the milestone pass by unnoticed. Fortunately, fans of the series still got their due celebration, and a particularly stand-out indie game called Axiom Verge--which clearly drew heavy inspiration from Samus' 2D outings--also saw release on the Wii U eShop. We scored it a rare 10/10 here, and now it seems that the game will be getting a special release on several platforms, Wii U included. Fans have been asking for a physical retail version of Axiom Verge since the game originally launched. I'm extremely excited that the Multiverse Edition will be coming to retail soon. As a solo developer, it's always been a dream of mine to see a game that I made end up on the store shelves! What do you think? Will you be picking this up? How did you like Axiom Verge? Drop us a comment in the section below. Is it coming to Europe? It only mentions $29.99 and with some of these indie games that get a physical release they only come out in America, e.g. Tumblestone and Runbow. For the first time in my life, I want to preorder something. @SLIGEACH_EIRE That little pegi 12 in the bottom left suggests so! I could picture this becoming a collector's item. Indy game on a sun-setting console. I envisage it'll be made in very limited numbers and that most people won't pick it up. Could be one of those games that commands a fortune about 10 years from now when people get all nostalgic for the Wii U.
I don't even have a Wii U, but I'll pick this up. It's guaranteed to be a collectors item due to low quantities. You spelled Switch wrong... no, wait! Awesome, one way or another, I'll have to check this out soon. Already got the physical box on PC from Indiebox, with the statue. Perhaps the cartridges for a Switch version were too expensive? Really hoping this will come to Switch. I never got round to pick it up due to various reasons and already large back log.I thought I'd wait and see if it comes to Switch instead. Maybe it'll be announced in tonight's presentation? Would buy if it came to Europe and I already hadn't bought the digital release on day one. This kind of package should've come originally last year to Wii U. It looks really great! Day one! Would prefer to get this on Switch but I'll happily take it on Wii U instead. Yes I will be getting this .. I'll try and get this if it comes to EUR/UK. I definitely like the look of the game, but my gaming backlog and general apathy towards download only games has meant I haven't purchased it yet. I'm glad it's on Wii U too as I don't plan to get a Switch for a while. What a bonus!! I held off getting this as I prefer physical purchases and now look. What a treat! This will be the perfect send off for my little black box of underrated quality. Absolutely getting this. Where can I preorder? No North American version I assume? Really hoping we get a Switch version, too! @bobba_knight for 'fortune' read double the price - best case scenario. @JaredJ The article states the price in dollars (granted, that could be AU$), and the picture has 'T for Teen' in the bottom-left corner - ESRB is exclusively a North American rating system, so I'm gonna say it's a 'yes'. This game was awesome, but I don't see me buying it a second time on the Wii U, though this does come with some cool stuff. If I was more wealthy I would for the sole fact thay I'd like to support them. Glad I never got the digital version. What about a Switch version? I won't buy for wii u, wii u is dead, silly developers would be better to release on switch!!!!!!!!!!! Switch is where I'd like to get the game, I held out on getting it on the eShop for that reason. Please port it over and give it a physical release on Switch. 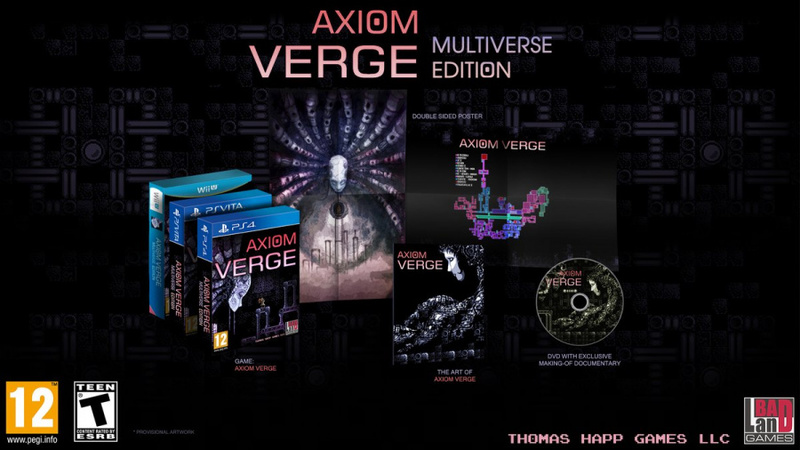 "Fans have been asking for a physical retail version of Axiom Verge since the game originally launched"
I'm aware of at least two physical editions of this that already exist, one of which you can get from Gamestop. I just barely missed the sale when it was first released, so I've been waiting to pick it up. Physical copy is an awesome bonus, especially since the Zelda pre-loader is going to take up the last of my internal storage. I thought the game looked great, but I passed on the Digital version. But I will buy the physical version no doubt. Awesome! I'll be happy with a Switch version even if digital-only because I have this one on the wish list just had to stop buying stuff I never had time to play — halfway through Toad Treasure Tracker! Love that this individual developer is making a retail release happen, though. Good for him. My feeling on the Wii U is strange now, though. I'm getting a Switch and I know that the Wii U will still get plenty of play for this first year because my son still goes back to Disney Infinity and Nintendo Land regularly, but how much more do I want to buy digital games for it? Not sure how I feel about that yet, especially since it's looking like Switch might be an excellent sweet spot for indie games and many developers appear to feel the same way. I must get this one. WiiU retail version in Europe please - insta-buy from me. I will happily pre-order if this is available. Would much rather a digital release on Switch! @Sean161 GBA and SNES are dead too, but I'd gladly buy a retail version of a new good game on any of them. Good thing I haven't bought it from eShop yet haha. I will definitely buy this. I hope it become available here where I am. Woah this is almost enough to get me to keep my Wii U out. I might have to check this out! Though if it's a published physical release is it still an indie? It's a joyous day seeing these low and mid-tier publishers popping up actually publishing unsigned studios....like gaming USED to be until the mid '00's. Fantastic news. I had assumed BOTW would be my WiiU swan song, but I'll definitely pick this up and give it a try in 2022 after I've explored the Great Plateau. Nice. But I think I'll go just for the download, when its 10 Euro or less! This thing will be worth triple that by the time Metroid Switch comes out. That's great news! I just hope there will also be a physical release for PC! I've already bought the game via Steam, but I would buy it again if it's on a disc. Thank God I didn't buy it, I prefer a physical version. Although I hope there will be a Switch version, I also prefer carts. @Markiemania95 did not notice the ESRB rating in the bottom left corner. Thanks for pointing it out. Day one for sure if can get the Wii U when it drops. I'll probably get it and leave it sealed just for collectors sake, since my Wii U collection is amazing. As for the game itself... I got pretty tired of it after a couple of hours. I don't think it had varied enough visuals to keep my attention. Also I was expecting more super metroid based on all reviewers calling it "metroidvania" style. It's way closer to OG Metroid on NES.